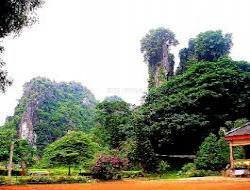 Kampong Trach is the district that borders Vietnam. The road trip from Kampot to the main town passes though some picturesque rural areas. There is a new side road to Kampong Trach town that skirts the base of Phnom Voar, (where the victims of the 1994 Khmer Rouge kidnappings were held.) These mountain areas of Kampong Trach were one of the last Khmer Rouge holdouts. Kampong Trach town is small and relatively uninteresting. 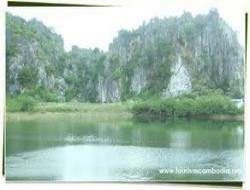 The area's main attraction is a series of limestone caves and tubes that have been carved.into a nearby mountain. The roof of a large cave in the center of a mountain has collapsed, making a small, enclosed jungle.